Over the last few decades, the field of management enlarged its boundaries, especially in international terms, in a very rapid fashion-mainly because of the arrival of the so-called era of globalization. Many renowned scholars have criticized the universal approach given to `management' in the United States and its subsequent automatic conversion into `international management,' but their arguments too can fall into the trap of universalism at times. This book has a more specific concern: to challenge the conversion of `management' into `international management' from a Latin American perspective. This challenge might be taken as a first step toward the construction of a Latin American perspective in International Management and a potential contribution to the development of this field in other parts of the world. 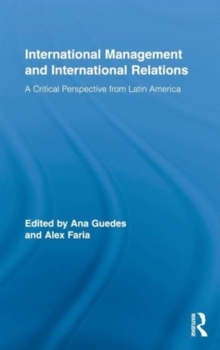 Drawing upon such critical standpoint, several authors in the book converge upon the idea that researchers, practitioners and authorities in Latin America should challenge the US dominance in International Management and foster interdisciplinary developments within International Relations. The critical perspective provided in this book challenges the US's narrow viewpoint on management as it clearly does not fit the governance features of `international management' in Latin America. So far, we have not observed the constitution of sub-areas such as international management of international organizations, international management of transnational institutions, international management of public-private networks, international management of public companies, and international public administration or international public management, all of which would be extremely important in Latin America.